Yes, it’s that time of the year again. Fall! The temperatures are starting to drop, and there’s a wonderful sense of change and possibility in the air. 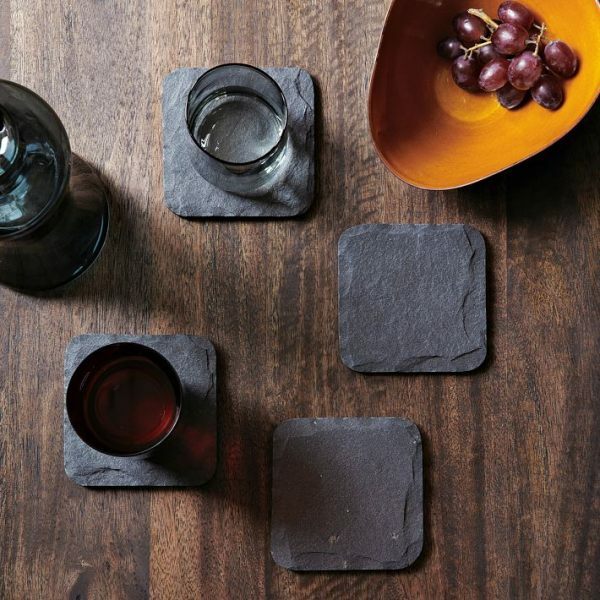 Could there be new possibilities for your tabletop as well? 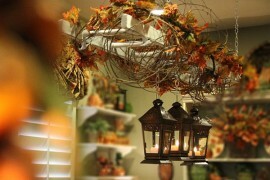 As the leaves begin to change color, why not take your cue from nature and bring a touch of autumn indoors? 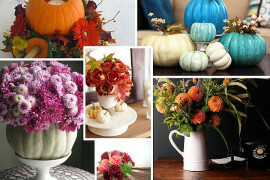 If a large spread of fall festivity is not your thing, never fear. One or two large pieces can make just as strong a statement. 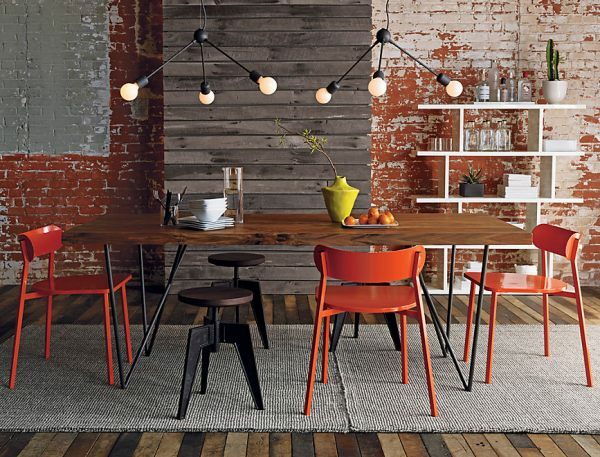 Take the dining room below, which features a nucha vase from CB2, as well as a tray of citrus fruit. 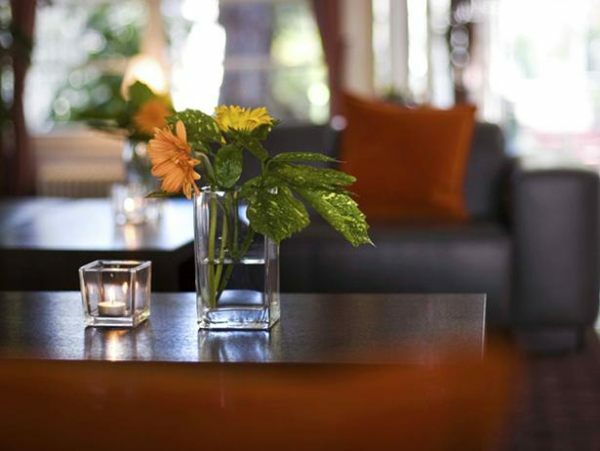 Modern and vibrant, this pairing is eye-catching enough to command the attention of the entire room. 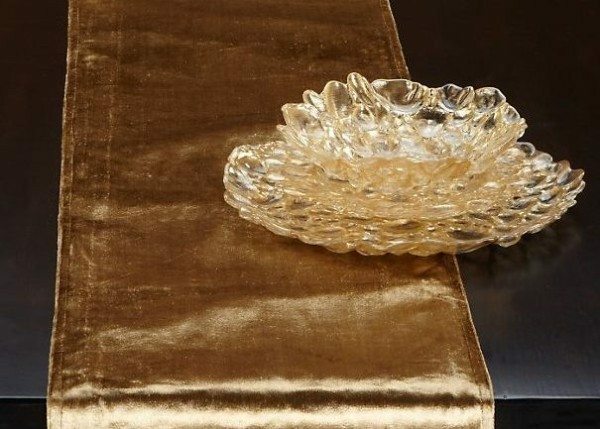 Keep it classy with an elegant gold velvet runner from Z Gallerie, then complement it with other golden accents, such as delicate dishware. Not pictured: the fabulous tassels that dangle from each end of the runner! 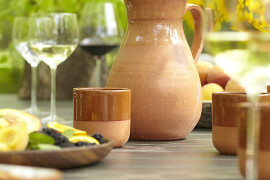 For a more casual approach, go with a couple of sturdy ceramics. 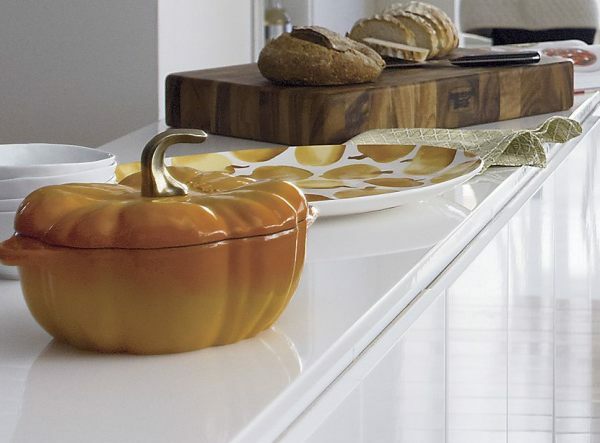 The Staub Pumpkin Covered Casserole and Pumpkin Platter from CB2 are fun and low-key, yet contemporary enough to mix with a simple wooden cutting board and modern linens. 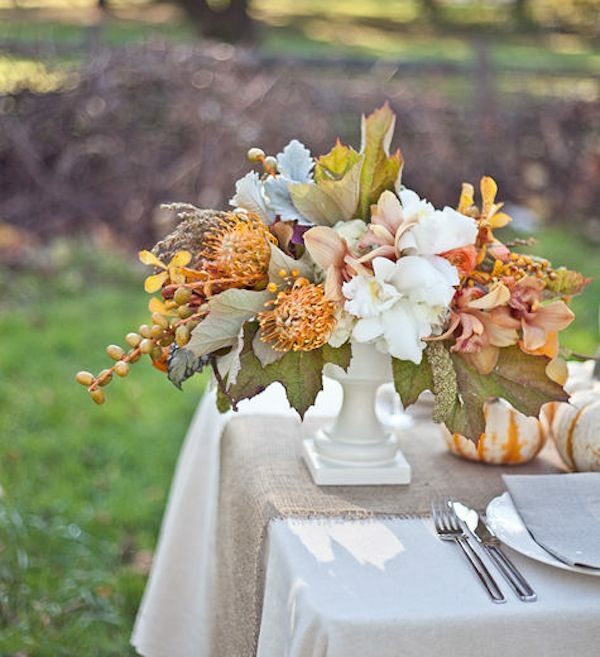 Sometimes more is more, and perhaps because autumn reminds us of harvesting food, many centerpieces feature clusters of items for a “cup runneth over” effect. Below we see a table filled with goodies. Our favorite in the bunch? 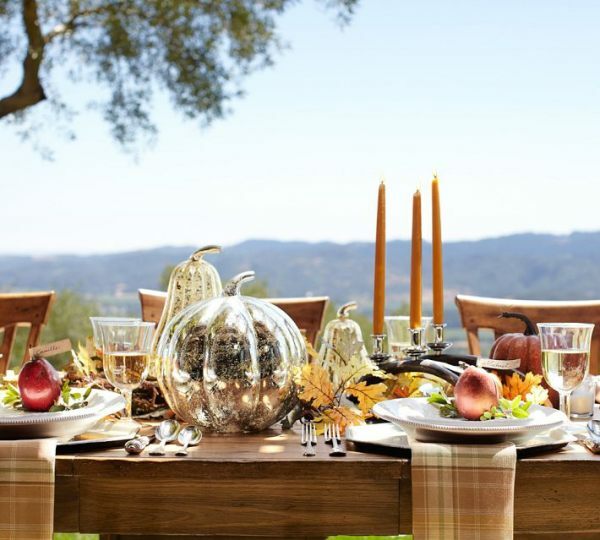 The Antique Mercury Glass Pumpkins from Pottery Barn. 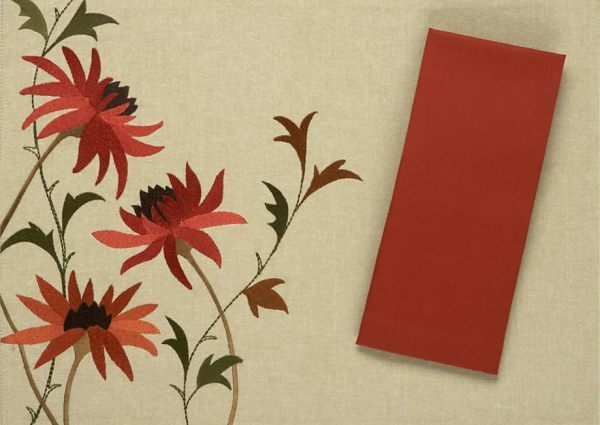 They remind us that every eye-catching grouping needs a focal point! 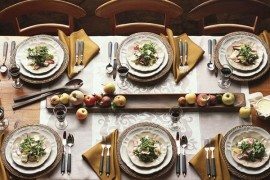 The individual components of a tabletop display are as important as the overall effect. 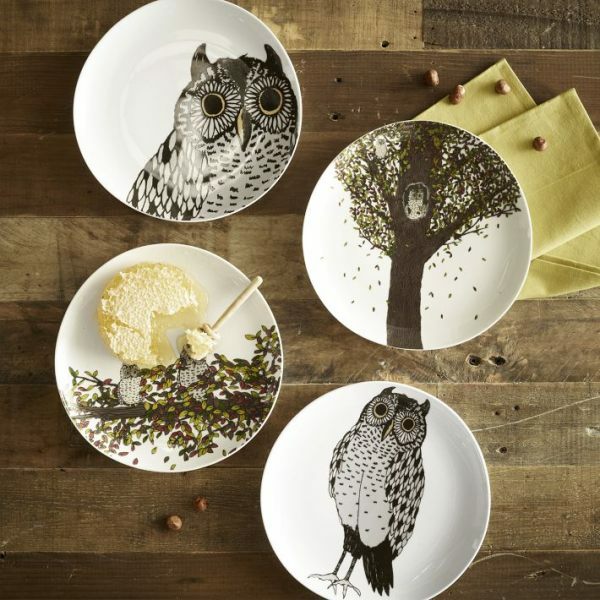 Pepper your display with beautiful dinnerware, like these special Owl Dessert Plates from West Elm. 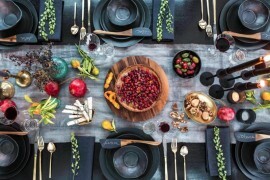 They make fall dining fun and stylish while offering a shiny yet understated look. 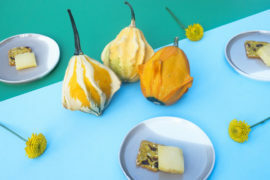 Nothing evokes the joy of nature’s bounty like the Marimekko Lumimarja line, available through Crate and Barrel. In the next image, we see this bold pattern in orange. 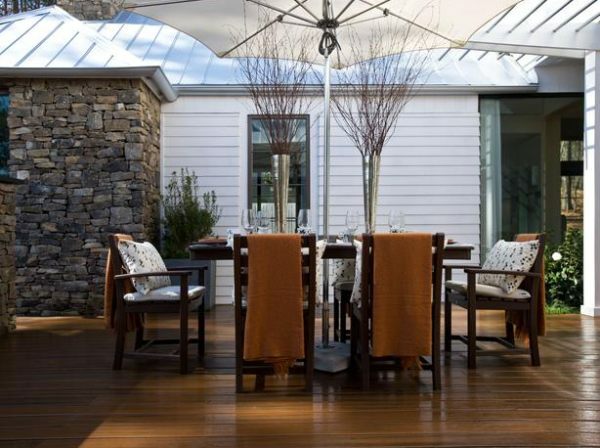 Lovely and modern, especially in a neutral room! 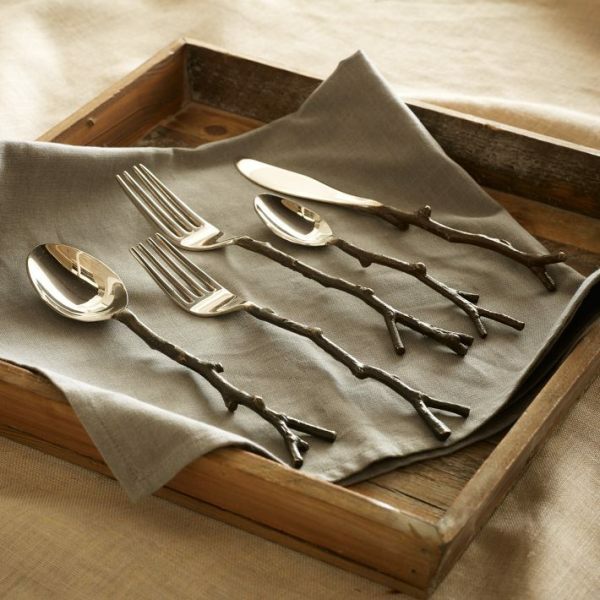 Don’t forget to honor your design style and sensibilities by selecting tabletop pieces that speak to your taste. 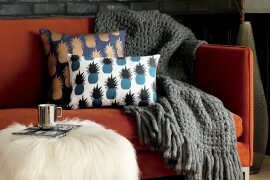 Are you a fan of geometric patterns and Hollywood Regency flair? 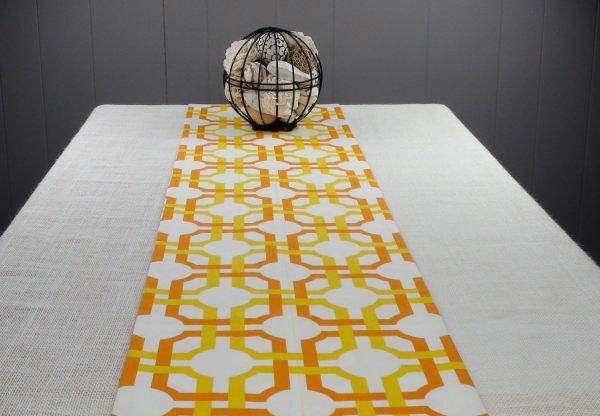 Check out the Modern Orange and Green Table Runner from Etsy shop Proper Pillow, shown below. 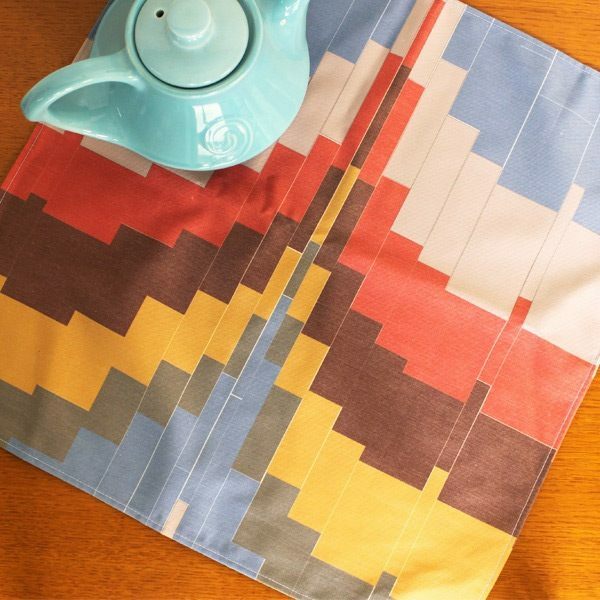 Not to mention, this item has an added bonus: it’s reversible! That’s right, folks–the other side features the same pattern in green. Flip it over and keep it on the table for Christmas! 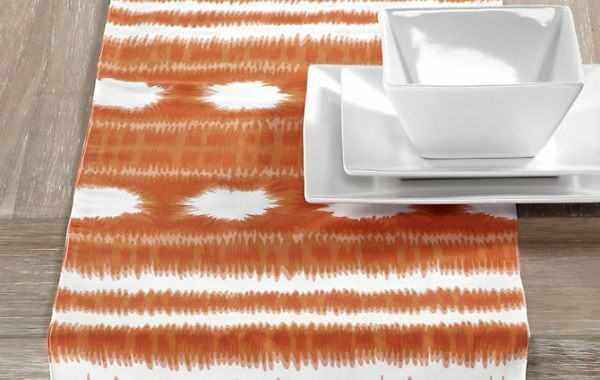 If you’re a fan of Ikat, check out the Kamal Runner from Z Gallerie, a reversible piece that features two different patterns in rust. 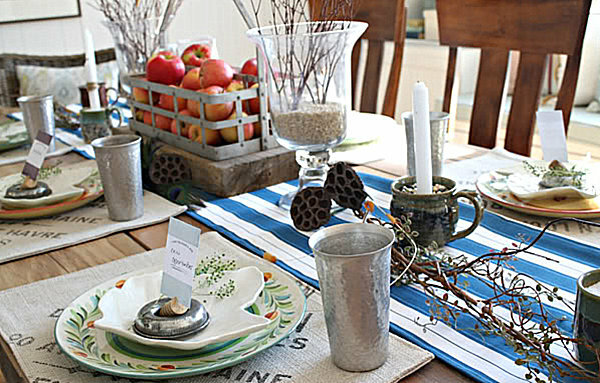 Play up the white detailing with crisp modern dishes, as shown in this next image. 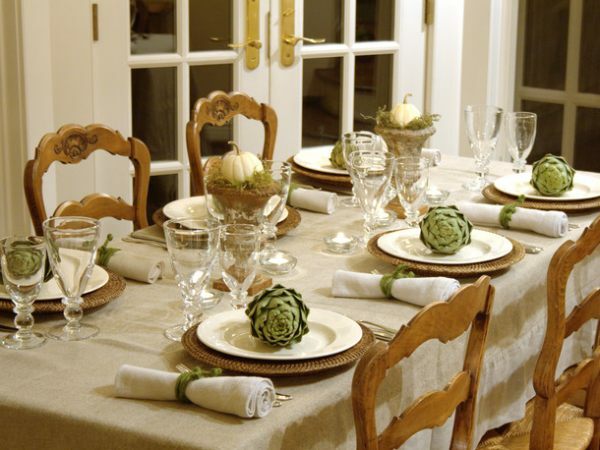 Not planning a fall dinner party just yet? 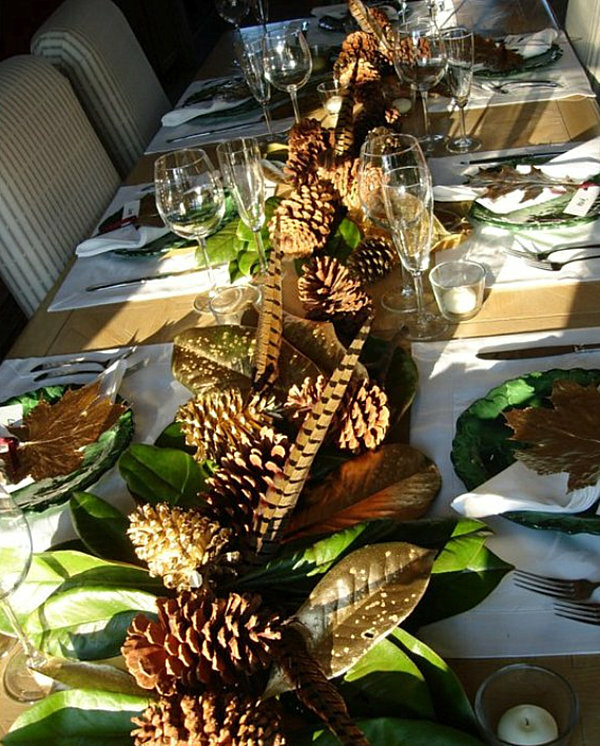 Tabletop decor isn’t just for guests–it’s for your enjoyment as well! 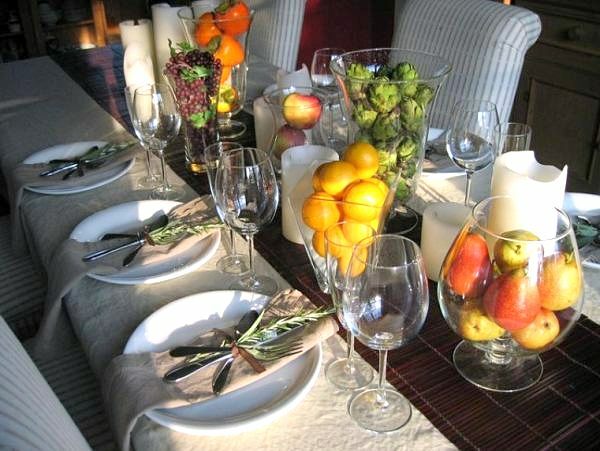 Seeing touches of autumn on your table is a joyful reminder of the beautiful changes in nature that happen at this time of the year. 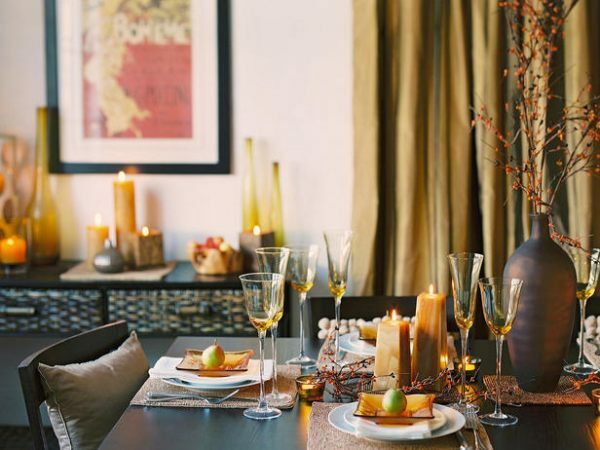 If a big spread isn’t your style, celebrate the season in small ways, such as with a simple vase of flowers or some vibrant textiles. 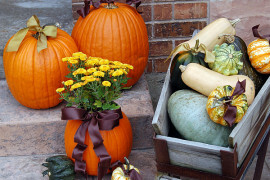 And don’t underestimate the delight of purchasing a pumpkin or two! 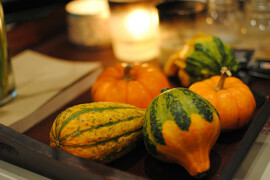 Even these signature fall items come in unexpected colors like white and green!